Other designations: Manuchihr Mosque; Manuche Mosque; Ebul Menuçehr Camii; Ulu Camii; "Customs House"; "Palace of the Catholicos". 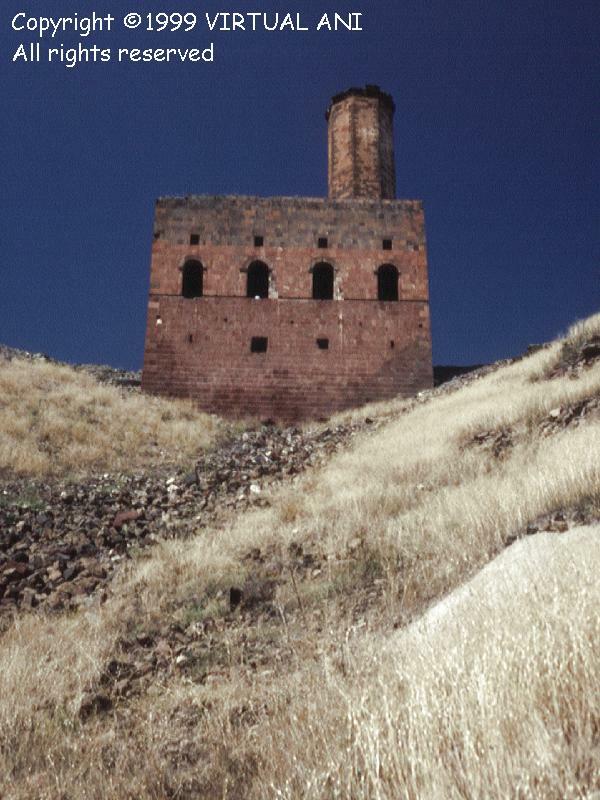 This mosque, built at the very edge of the ravine overlooking the Akhurian River or Arpa Çay, is said to have been founded by the emir Minuchihr. He was the first of the Shaddadid dynasty that ruled Ani from around the year 1072 onwards. However, the actual construction date and origin of this building is still subject to much argument - arguments based more on competing nationalistic claims of Armenia and Turkey than on any hard architectural or archaeological evidence. 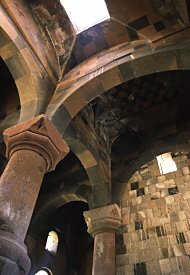 Some (Armenians mostly) hold that the building predates the Turkish conquest and that it was originally a palace from the Bagratid period, later converted into a mosque. 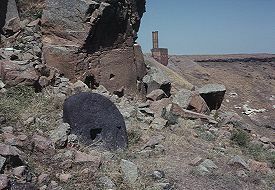 Nikolai Marr, in a surprising lapse of reasoning, dated it to the reign of King Ashot III for no other reason than that the colour of its stone is similar to that of the nearby Wall of Ashot. Because of its position beside King Ashot's walls, and its fortified appearance, it has also been suggested that it was originally a customs house, or even the residence of the Armenian Catholicos. 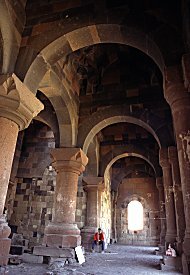 Another Armenian theory is that the building is actually the zhamatun of a now destroyed church, converted to a mosque after the church's destruction. These theories have the same dubious basis - the belief that the Muslim rulers of Ani were incapable of building anything substantial during their period of control. 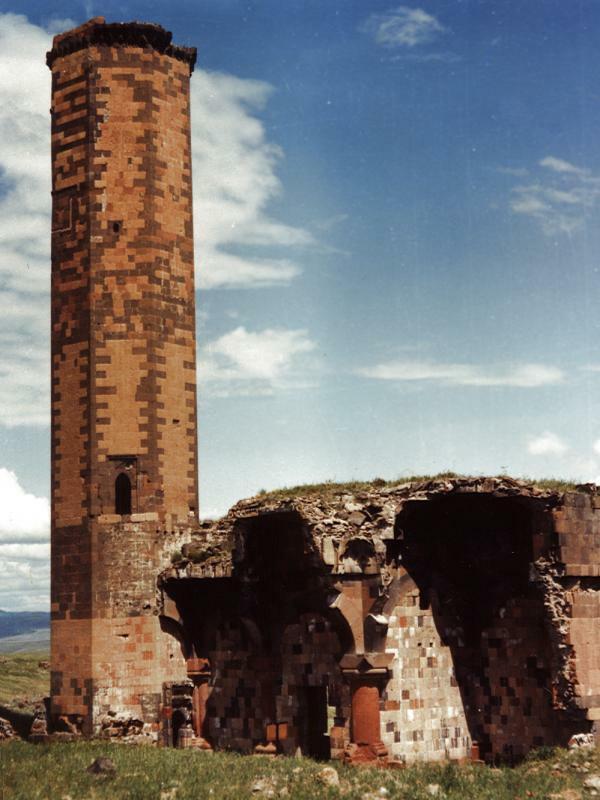 Others (Turks mostly) consider the whole structure to have been purpose-built as a mosque just after the Turkish conquest of Ani, making it the earliest surviving Turkish mosque in Anatolia. Yet others suggest that though it was built as a mosque, it dates from a later period since the interior is similar to other 12th and 13th century buildings. I believe this to be the most likely option, but that the present structure partly utilises older foundations - hence its strange alignment. 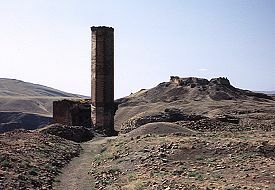 Also, the minaret predates the present structure, which explains the minaret's strange location, and was probably built to accompany an earlier mosque. The above engraving is by M.-F. Brosset and shows the interior of the mosque in the 1850s. 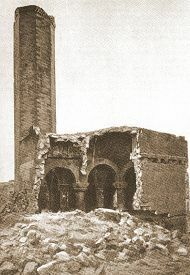 The mosque's west facade had completely collapsed by the end of the 19th century, but the ruinous building continued to be used as a mosque by local Muslim villagers until 1906 ¹. That year it was turned into a museum for Nikolai Marr's excavation finds. To make the building secure the open vaults on the western side were walled up. These new walls are coloured grey on the plan below. Marr also rebuilt the large window in the surviving part of the northern wall. This little museum was looted at the end of the First World War. As late as the 1990s many small fragments of glass could be seen on the floor, probably from smashed display cases or photographic plates, and there were sculptural fragments at the base of the mosque that may have been thrown from its windows. The stone paving on the floor was also removed at some point after the destruction of the museum. 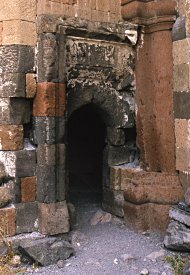 There is a shallow mihrab crudely cut into the interior south wall of the mosque. 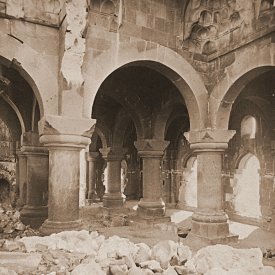 It is not there on photographs of the interior taken when it was in use as a museum, suggesting that for a while the building resumed its function as a mosque after Turkey captured Ani in 1920. 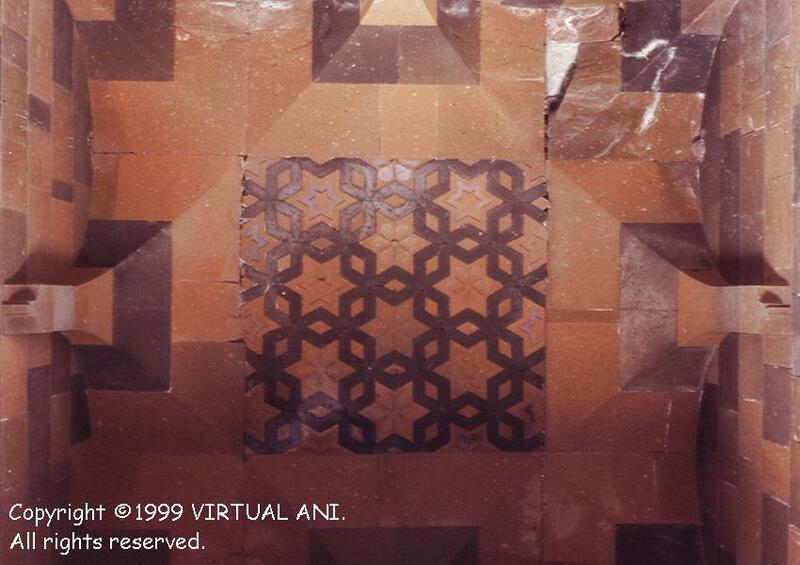 In 1990 the mosque was surveyed and measured by a group of architecture students from Ankara. Some foundations immediately to the north of the minaret were excavated by Karamağaralı in 1991. 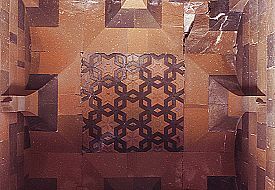 In 1999 a limited "restoration" began inside the mosque (the floor was given new paving) and the following year work started on rebuilding the missing walls. This rebuilding, which is of high quality, has not extended beyond a short section of the south wall. In 2003 (?) the ground inside the western part of the mosque was cleared of soil and debris, revealing the original floor level and the position of the entrance. For simplicity, in this analysis the facade with windows overlooking the Akhurian is assumed to be facing east (it actually faces south-east), and so on. The building is not orientated in the normal direction for a mosque - it is about 20 degrees out. The extensive basement, the large windows, and other aspects of the design are also not typical of mosques. 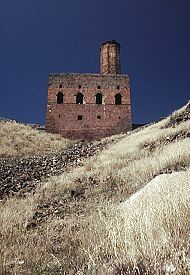 Visitors to Ani often joke that it looks rather like a 19th century Victorian cotton-mill! The plan of the mosque used in this page is adapted from Professor Beyhan Karamağaralı's published drawings ². Earlier surveys, from the Russian period, are inaccurate. The mosque is a rectangular structure, 18.5 metres by 15.7 metres. The entrance was at the northern end of the west facade. The interior comprised a rectangular prayer-hall whose roof was supported by six freestanding columns that divided the interior space into eleven compartments - only six compartments now survive intact. The designs of the ceilings over these compartments are different from each other, and are richly decorated with polychrome stone inlays. 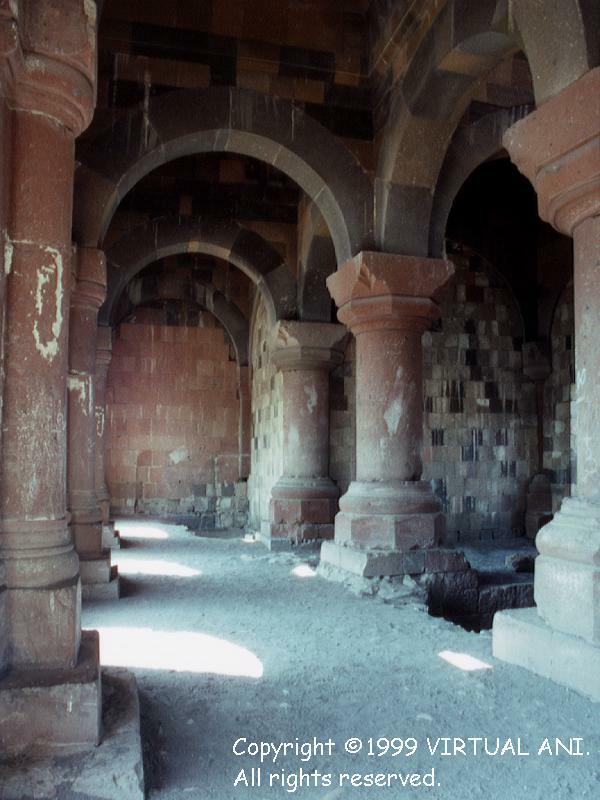 The columns are short and fat, with capitals bearing muqarnas ornamentation. 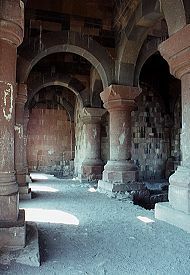 Similar columns can be found inside the hall at the monastery of Horomos, thought to date from the 1030s, but they are more common in 12th and 13th century structures (for example, those at Bagnayr monastery). Underneath the four easternmost compartments (those overlooking the ravine) is a basement, also with four compartments, each with a barrel vault. It is said (without any archaeological evidence) that these rooms were used as burial places for important people. The western wall of the basement is probably older than the rest of the mosque since the vaults of the basement roof are not bonded into it, but merely lean against it. The prayer-hall was lit mainly by five large windows; four with semicircular arches and one with an ogee arch. There are beam-holes on the exterior facade facing the ravine, above and below the large windows, suggesting that there was once a wooden balcony on the outside. Above the large windows are smaller rectangular openings whose main purpose seems to have been to illuminate the decorated ceilings. 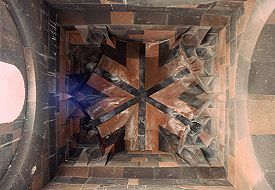 Similar small windows, called "upper lights" are common in Ottoman houses, particularly around Kayseri. 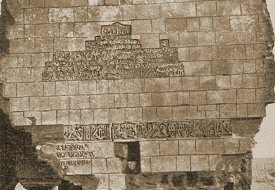 Old photographs reveal that on the exterior wall of the collapsed west facade there were various inscriptions. At the top was a long inscription in Persian: an edict or firman mentioning Abu Sa'id Bahadir (an Ilkhan ruler), dated (?) 1330. Abu Sa'id ruled from 1316 to 1335. 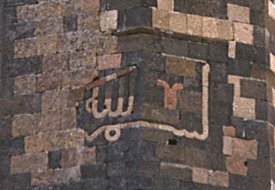 Below this, in the form of a long horizontal band, was an incomplete monumental inscription saying that the emir Minuchihr founded the mosque. Below this was a fragmentary inscription in Armenian, of at least three lines and rather crudely carved. Adèle Kamsarakan, writing in the book "Ani, Capitale de l'Arménie en l'An Mil" and attempting to minimise the Islamic elements in the Minuchihr mosque, chose not mention these inscriptions and instead talked about "a long tri-lingual inscription in Persian, Armenian, and Georgian". This inscription does not exist. 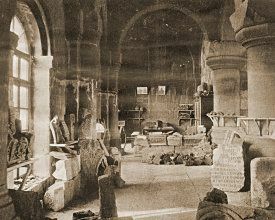 Nikolai Marr, when excavating in the vicinity of the mosque in 1909, discovered "Arabic, Iranian, Georgian, and Armenian inscriptions from the mosque". This seems to be the origin of the "tri-lingual inscription" statement. Marr's same excavation recovered the blocks of stone bearing the Abu Sa'id inscription. In 1912 this inscription was re-assembled and displayed within a wooden frame beside the museum's entrance. The inscription is now lost. Marr also discovered that along the length of the west facade, which faced onto a street, were large stone benches for sitting or sleeping on. A tall, octagonal minaret stands at the northwest corner of the mosque. It has the Arabic word "Bismillah" ("In the name of God") written in Kufic lettering high on its northern face. A steep spiral staircase winds its way anticlockwise around a central pillar up to the top of the minaret. On the way up the interior is lit by one large window and then by several small ones. The large window may have doubled as an access point to the mosque's flat roof. Turkish books state that there are 99 steps to the top, however there are actually only 93. The summit is completely open today - originally there would have been a stone parapet ³. 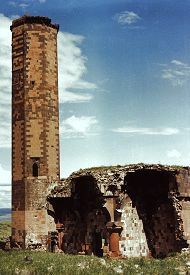 As mentioned earlier, the minaret's position is curiously ill-fitting in relation to the rest of the mosque, indicating that it was constructed before the rest of the building was finished. The design of the doorway to the minaret suggests that the minaret was originally freestanding. 1. 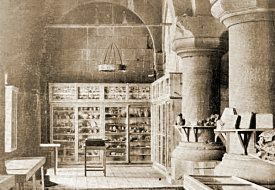 Some books give the date 1907 for this conversion, however, N. Marr published a guidebook to the mosque museum in 1906. 2. See: Beyhan Karamağarlı, Ani excavation report in Kazı Sunucları Toplantısı, volume XIV, p509-538, Ankara, 1992 (in Turkish). Beyhan Karamağarlı, Ani Ulu Cami (Manucehr Camii), in 9th International Congress of Turkish Art, Summary of Contributions, p323-338, Ankara, 1995 (in Turkish). 3. Under current restrictions it is forbidden to climb the minaret, but it may be possible if there are no soldiers or civilian guards nearby. Soldiers sometimes use the top as a lookout post. It was also forbidden to climb it during the 1980s, when soldiers had to accompany visitors as they toured the ruins. In those days, the soldiers would explain the restriction by saying that it was because a tourist had once committed suicide by throwing himself off the top of the minaret. The nationality of this tourist would vary according to the nationality of the visitors. The suicide story was just that, a story: no such suicide has ever actually happened. This page [mosque of Minuchihr] was first published in 1999. It was last modified on the 25th May 2005.